For the folkloric being of Ghana and Togo, see adze (folklore). For the village in Bosnia-Herzegovina, see Adže. An adze (/ædz/; alternative spelling: adz) is a cutting tool similar to an axe but with the cutting edge perpendicular to the handle rather than parallel. They have been used since the stone age. Adzes are used for smoothing or carving wood in hand woodworking. Two basic forms of an adze are the hand adze—a short handled tool swung with one hand—and the foot adze—a long handled tool capable of powerful swings using both hands, the cutting edge usually striking at foot or shin level. A similar, but blunt, tool used for digging in hard ground is called a mattock. 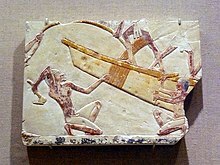 The adze is depicted in ancient Egyptian art from the Old Kingdom onward. Originally the adze blades were made of stone, but already in the Predynastic Period copper adzes had all but replaced those made of flint. While stone blades were fastened to the wooden handle by tying, metal blades had sockets into which the handle was fitted. Examples of Egyptian adzes can be found in museums and on the Petrie Museum website. The ahnetjer (Manuel de Codage transliteration: aH-nTr) depicted as an adze-like instrument, was used in the Opening of the Mouth ceremony, intended to convey power over their senses to statues and mummies. It was apparently the foreleg of a freshly sacrificed bull or cow with which the mouth was touched. As iron age technology moved south into Africa with migrating ancient Egyptians, they carried their technology with them, including adzes. To this day, iron adzes are used all over rural Africa for various purposes - from digging pit latrines, and chopping firewood, to tilling crop fields - whether they are of maize (corn), coffee, tea, pyrethrum, beans, Millett, yams or a plethora of other cash and subsistence crops. Polynesian adzes were generally made of basalt, a type of stone that is not uniformly available in the Pacific. It is not found on atolls, for example, and its quality for tool-making varies according to the source island/quarry. This variation inspired a growing network of long-distance trade, in which sailing canoes carried this material over thousands of kilometres. With the advent of X-ray fluorescence (XRF), it is now possible to analyse an adze head and trace its geochemical source back to the originating quarry. By applying this technique to archaeological finds of adze-heads, a vast web of long-distance prehistoric interaction has been revealed, providing hard evidence of intentional two-way navigation well before Europe's Age of Exploration began. Prehistoric Māori adzes from New Zealand, used for wood carving, were made from nephrite, also known as jadein the South Island. In the North Island they were commonly made from greywacke or basalt. At the same time on Henderson Island, a small coral island in eastern Polynesia lacking any rock other than limestone, natives may have fashioned giant clamshells into adzes. American Northwest coast native peoples traditionally used adzes for both functional construction (from bowls to canoes) and art (from masks to totem poles). Northwest coast adzes take two forms: hafted and D-handle. The hafted form is similar in form to a European adze with the haft constructed from a natural crooked branch which approximately forms a 60% angle. The thin end is used as the handle and the thick end is flattened and notched such that an adze iron can be lashed to it. Modern hafts are sometimes constructed from a sawed blank with a dowel added for strength at the crook. The second form is the D-handle adze which is basically an adze iron with a directly attached handle. The D-handle, therefore, provides no mechanical leverage. Northwest coast adzes are often classified by size and iron shape vs. role. As with European adzes, iron shapes include straight, gutter and lipped. Where larger Northwest adzes are similar in size to their European counterparts, the smaller sizes are typically much lighter such that they can be used for the detailed smoothing, shaping and surface texturing required for figure carving. Final surfacing is sometimes performed with a crooked knife. Ground stone adzes are still in use by a variety of people in Irian Jaya (Indonesia), Papua New Guinea and some of the smaller Islands of Melanesia and Micronesia. The hardstone is ground on a riverine rock with the help of water until it has got the desired shape. It is then fixed to a natural grown angled wood with resin and plant fibers. The shape and manufacture of these adzes is similar to those found from the Neolithic stone age in Europe. A variety of minerals are used. Their everyday use is on a steady decline, as it is much more convenient to cut firewood using imported steel axes or machetes. However, certain ceremonial crafts such as making canoes, ceremonial shields, masks, drums, containers or communal houses etc. may require the use of traditional-made stone adzes. Modern adzes are made from steel with wooden handles, and enjoy limited use: occasionally in semi-industrial areas, but particularly by 'revivalists' such as those at the Colonial Williamsburg cultural center in Virginia, USA. However, the traditional adze has largely been replaced by the sawmill and the powered-plane, at least in industrialised cultures. 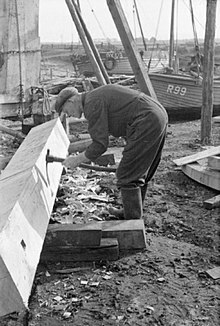 It remains in use for some specialist crafts, for example by coopers. Adzes are also in current use by artists such as Northwest Coast American and Canadian Indian sculptors doing pole work, masks and bowls. "Adzes are used for removing heavy waste, leveling, shaping, or trimming the surfaces of timber..." and boards. 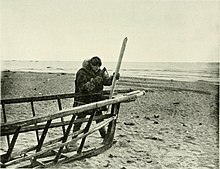 Generally, the user stands astride a board or log and swings the adze downwards between his feet, chipping off pieces of wood, moving backwards as they go and leaving a relatively smooth surface behind. Foot adzes are most commonly known as shipbuilder's or carpenter's adzes. They range in size from 00 to 5 being 3 1/4 to 4 3/4 pounds (1.5–2.2 kg) with the cutting edge 3 to 4 1/2 inches (75–115 mm) wide. On the modern, steel adze the cutting edge may be flat for smoothing work to very rounded for hollowing work such as bowls, gutters and canoes. The shoulders or sides of an adze may be curved called a lipped adze, used for notching. The end away from the cutting edge is called the pole and be of different shapes, generally flat or a pin pole. Carpenter's adze - A heavy adze, often with very steep curves, and a very heavy, blunt pole. The weight of this adze makes it unsuitable for sustained overhead adzing. 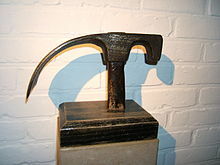 Railroad adze - A carpenter's adze which had its bit extended in an effort to limit the breaking of handles when shaping railroad ties (railway sleepers). Early examples in New England began showing up approximately in the 1940s–1950s. The initial prototypes clearly showed a weld where the extension was attached. Shipwright's adze - A lighter, and more versatile adze than the carpenter's adze. This was designed to be used in a variety of positions, including overhead, as well as in front on waist and chest level. Lipped shipwright's adze - A variation of the shipwright's adze. It features a wider than normal bit, whose outside edges are sharply turned up, so that when gazing directly down the adze, from bit to eye, the cutting edge resembles an extremely wide and often very flat U. This adze was mainly used for shaping cross grain, such as for joining planks. Another group of adzes can be differentiated by the handles; the D-handled adzes have a handle where the hand can be wrapped around the D, close to the bit. These adzes closely follow traditional forms in that the bit or tooth is not wrapped around the handle as a head. The head of an ice axe typically possesses an adze for chopping rough steps in ice. A firefighter tool called the Halligan bar has a dull adze on one end of the bar. This bar is a multipurpose tool for forcible entry of a structure and demolition with a forked pry-bar on one end and an adze and spike on the other, called the adze-end. Demolition adze - A demolition adze has a dull edge and is used for separating materials in the demolition or salvage of old buildings. There are also a number of specialist, short-handled adzes used by coopers, wainwrights, chair makers, and bowl and trough making. Many of these have shorter handles for control and more curve in the head to allow better clearance for shorter cuts. Wikimedia Commons has media related to Adzes. Look up adze in Wiktionary, the free dictionary. ^ Shubert SB, Bard KA (1999). Encyclopedia of the archaeology of ancient Egypt. New York: Routledge. p. 458. ISBN 0-415-18589-0. ^ Erman A, Grapow H (1926). Wörterbuch der ägyptischen Sprache [Dictionary of the Egyptian language]. 1. Leipzig: JC Hinrichs. p. 214.24. ^ Schwabe CW, Gordon A (2004). The quick and the dead: biomedical theory in ancient Egypt. Leiden: Brill. p. 76. ISBN 90-04-12391-1. ^ Eyre C (2002). The cannibal hymn: a cultural and literary study. Liverpool: Liverpool University Press. p. 54. ISBN 0-85323-706-9. ^ Diamond, Jared (1997). Guns, Germs, and Steel. New York, N.Y.: Norton. p. 67. ISBN 0-393-31755-2. ^ a b Salaman, R. A.. 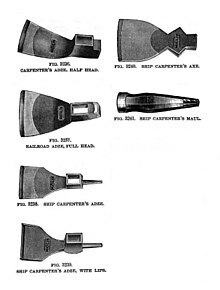 Dictionary of tools used in the woodworking and allied trades, c. 1700–1970. USA edition, New York: Scribner, 1975. 23. Print. The section about types of adzes is based on a Quicksilver Wiki article at A Glossary of Terms For Traditional Timber Framing (Timberbee) under the terms of the GNU Free Documentation License, last accessible 25 July 2006.